Born and raised in Vancouver, Amanda began training in musical theatre at the age of 5 and developed a passion for performing arts. She is a trained vocalist and dancer in jazz, street jazz, contemporary, modern, tap and ballet. Amanda has studied with the Arts Club, Gateway Conservatory, and numerous dance and performing arts studios in the Lower Mainland. For 2 years, she was a member of the Vancouver Tap Dance Society’s touring ensemble (TapCo) and travelled and performed across BC. She is currently a faculty member of the Vancouver Tap Dance Society teaching jazz, tap and musical theatre. Over the years Amanda has competed and placed at the provincial level in dance, stage and rhythmic gymnastics. 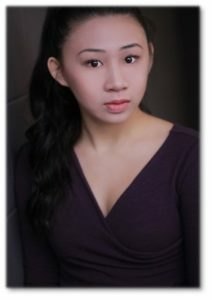 In addition to awards for Outstanding Vocal, Musical Theatre Performance and Triple Threat, she has also received theatre and dance scholarships across Canada which has allowed her to study with some of the world’s top professionals. Recent accomplishments include nominations for “Best Supporting Actress” (CTC Awards) and “Outstanding Supporting Performance” (Applause Musicals Society Ovation Awards). Theatre credits include Guys and Dolls, CATS, Ragtime, Slumber Here, Bye Bye Birdie and The 39 Steps. In addition she has worked in film, music videos and print ads. As a choreographer she enjoys the creative process of collaborating with local artists and dancers. Over the summer of 2018, she choreographed the musical “Guys and Dolls” for Fighting Chance Productions at the Waterfront Theatre in Granville Island. Outside of performing arts Amanda is a board member of a non-profit society and adjudicator for Tri-Cities Got Talent. She studies at Simon Fraser University, is an executive and dancer with the SFU Athletics Dance Team and peer mentor to incoming students at the university. She looks forward to sharing her passion for performing arts! « Meet Our 2019 Peace River South Festival of the Arts Vocal/Choral/Piano Adjudicator!